"Not so long ago and not so far away, people with guns could take a family, burn a house and disappear, leaving a small child alone in the world." So begins the true story of Selavi, a small boy who finds himself on the streets of Haiti. Selavi finds other street children who share their food and a place to sleep with him. Together they proclaim a message of hope through murals and radio programs. Youme is an artist and activist who has worked with communities in Kenya, Japan, Haiti and Cuba to make art which honors personal and cultural wisdom. Edwidge Danticat, Haitian author, adds an essay to Selavi. Mali Under the Night Sky is Youme's third book. Her first book--Selavi, A Haitian Story of Hope--won the Jane Adams Peace Award in 2005. The American Library Association chose her next book--a graphic novel called Pitch Black--as a Top Ten Graphic Novel for Teens in 2009. Mali Under the Night Sky is Youme's third book. 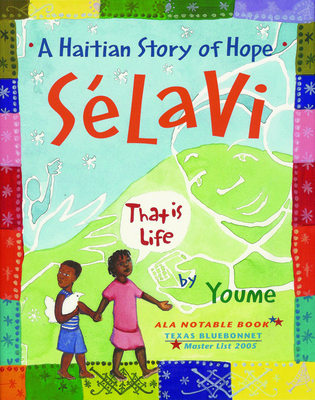 Her first book--Selavi, A Haitian Story of Hope--won the Jane Adams Peace Award in 2005. The American Library Association chose her next book--a graphic novel called Pitch Black--as a Top Ten Graphic Novel for Teens in 2009.